The organ can safely be attributed to Thomas Parker, both on stylistic grounds, and because of the tuning system, which is related to the organ made by Parker for the Foundling Hospital in 1768. The history of the organ cannot be traced further back than the late 19th century, so this connection is the only clue we have for the date. It may have belonged to the Verney family, since the earliest records refer to their possession of the organ. The is a John Collier painting of Morforwyn Fanshawe, daughter of Sir George Lloyd Verney, standing in front of the organ in about 1900, presumably at her father’s house at Clochfaen near Llangurig in Dyfed. The stylistic connection is with Thomas Parker’s work at Great Packington in Warwickshire, which is signed in pencil on the back of the Great key slip “this Organ was made by Thsº Parker London”, and with Richard Bridge’s late work (1758) at St Leonard Shoreditch on the NE edge of the City of London. The tuning system is that described in 1762 by Dr Robert Smith, President of Trinity College Cambridge, though the authorship was disputed by John ‘Longitude’ Harrison. It was applied to the organ at the Foundling Hospital at the instigation of Harrison’s son William. It is essentially meantone with pure thirds, with four extra pipes for c#, eb, g# and bb. There was a shifting movement, reducing the registration to the two Diapasons (if drawn). The bar frame of the wind chest was made in two halves, with a vertical slider between the two halves of the chest. The slider isolated the front half of the chest from the back, on which the Diapason pipes stand. 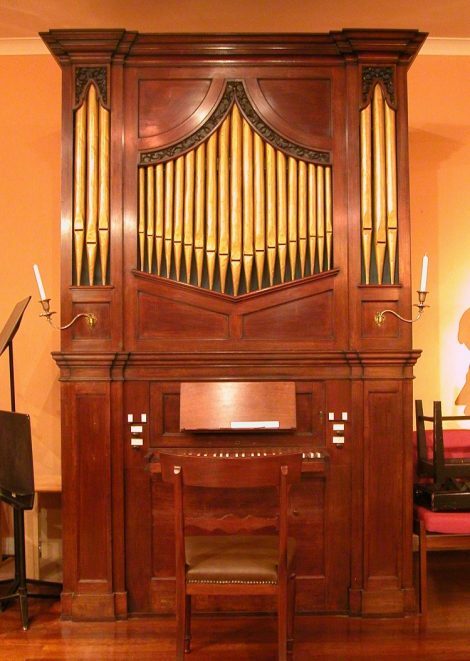 It may be that the Edinburgh organ was a prototype for this system, but it proved impossible to arrange the sliders in more than two positions, and it seemed logical to have a choice of sharp keys or flat keys, with g# and bb controlled from the bass side, and c# and eb from the treble side.